"The INVISIBLE Sisters’ guild (over 150 strong now!) is available for collaboration and co-branding. 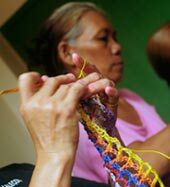 We invite professional designers, theater artists, and fashion houses to collaborate with INVISIBLE by commissioning pieces made by hand from their left-over production scraps or from local waste in Manila." The INVISIBLE Sisters are a growing guild, a factory without walls of women who are learning to manage their lives better. 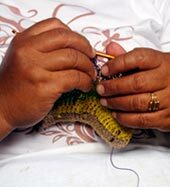 INVISIBLE retrieves the creative, intangible culture of hand arts – crochet and knitting. 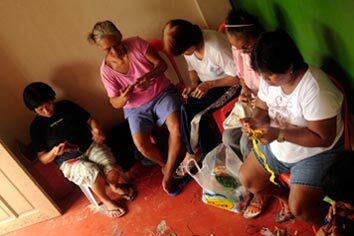 The INVISIBLE Sisters are urban poor mothers and grandmothers who receive weekly skills training workshops. The gatherings help them develop their craft, provide them with a much needed source of income, and gives self confidence and a sense of self worth.